Not far from Tržic is the village of Potarje where the Meglic family lives . They like to spoil their guests with food prepared with plenty of time and traditional cooking methods. They bake bread at home and look after vegetarians as well. Other activities on the farm are table tennis, bicycling, children's playground and hunting. 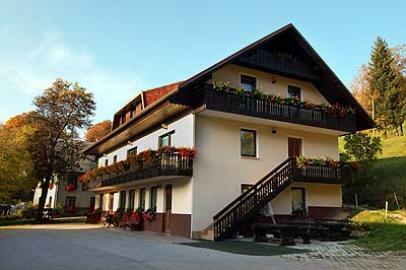 Guests can rent bicycles, sleds, and skis on the farm (the Zelenica ski center beside Ljubelj Pass is the closest). Hiking enthusiasts can go to the nearby mountains of Javornik, Košuta, Kriška gora, Stegovnik, and Storžic. Another interesting destination is the Dolžan Gorge, a site of fossils from the Permian period, the last period of the Paleozoic era, of world importance to researchers of the earths past. Activities in the area include skiing, cross-country skiing, tennis, outdoor swimming pool, paragliding, hang-gliding, boules and fishing.